Plese click on the logo, a submenu appears. It is said that the origin of all the species come from the sea. When you hear a word, ray, I think that most of the people imagine rays which swim gracefully and freely in the ocean. A lot of kinds of rays actually live in the ocean like you thought. However, on this website Mantenboshi, I write about the ones in the Amazon. They belong to freshwater ray. You might wonder why some kinds of rays that used to live in the sea started living in the Amazon. Of course, it is fresh water. 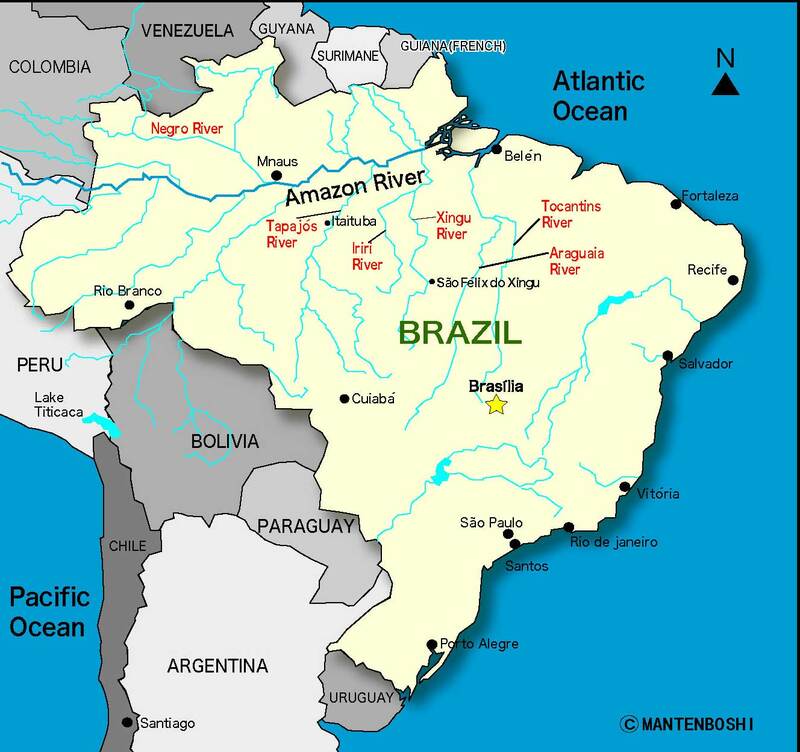 In one theory, diastrophism when the Andes were formed, the accident kept the rays in the Amazon which used to live near the one's estuary. There are some kinds of fish which are born in rivers and grown in the sea such as salmons and trout. However, freshwater rays are born and die in rivers. They spend their entire lives in rivers and never go to the ocean. One of their organs which work similar to the kidney is degenerated. It controls the salinity of their bodies and once they go into the ocean, they die. It could be said that freshwater stingrays went through the long evolutional process to live in rivers. There are roughly two kinds of stingray, black ones and brown ones. It lives in the Xingu basin in South America and can be more than 60cm. It mainly lives in around the Araguaia and the Tocantis. It also can be more than 60cm and looks very similar to polka dot. This kind has various colors and patterns of their bodies. There is some of this kind which has very light brown skin. They mainly live in the Amazon basis and are distinguished from each other according to which river they live in. Most of them have yellowy-brown skin but there are some of them which have nearly black skin. Dots' colors can be different individually. The dots are between yellow and orange. The color around their dots is dark brown and it looks like a doughnut. Most of their patterns are shaped like circles, but some of them are oval-shaped and oddly shaped circles. The number of their dots is also different therefore you can find a lot of variations. A pH of 6.5 is the best. However it is all right if it is from 6 to 7.5. It depends on the fish but the value of pH is the key. If the bacteria are active, it drops quickly. Also it happens the same when the water is dirty. You can avoid the quick drop and rise by placing charcoal pieces, and coral sand or small pieces of it. It lessens the damage to your fish. The bacteria eats carbon, so that it is good if you put some charcoal in a net and use it as a filter. When the pH falls, the coral sand works well. 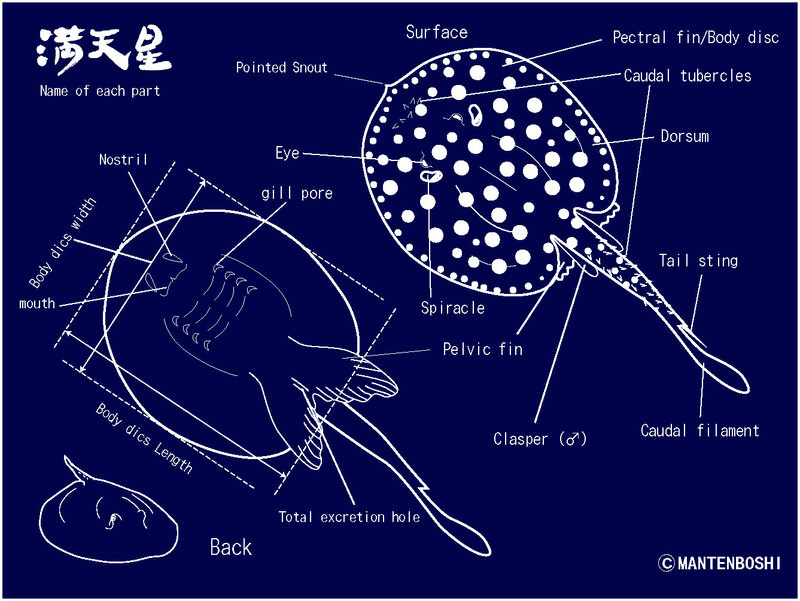 The best water temperature for the freshwater stingray is from about 25℃ to 30℃. It is better to set the water a little warmer around 28℃ to 30℃ during your stingray's pregnancy and the time the newly born babies still can not eat by themselves. Especially when your fish is pregnant and if the water is cold, it may make it late for your stingray to give a birth. You need to send a lot of air. The freshwater stingray is weak to hypoxia. The bacteria I am going to write about are called aerobic bacteria. It dies without air. The nitrous acid is related to the pH. Bacteria (Nitrobacteria) oxidize and change ammonia which the main part of left food that fish could not eat and excretions into nitric acid. Bacteria (Nitromonas) oxidize and change nitrous acid into nitric acid. They are very active when the water is weakly acidic. When the nitrous acid has low concentration, the value of pH is around 6.0 to 6.5. By the way when you talk about food for human, the use of nitrous acid is strictly restricted since it is a carcinogen. Nitric acid is famous because black gunpowder is made from it. When there is a lot in the water, it will be reduced to nitrous acid. You sometimes need to change the water in your fish tank to keep the concentration low. Measuring nitrous acid means measuring toxic so that you do not have to do it often. Once in a week would be enough. It is necessary since the change of 1℃ to fish mean the one of 10℃ to human. You would rather not to take care of it too much, but don't leave it either. When you already know these and want to learn more, please check out the sites below. This site shows you useful information about how to keep your fish.